Drought Puts Texas Ranchers, And Cattle, At Risk At an East Texas auction, the animals look pitiful. They're standing in 107-degree heat with their ribs showing, stressed out. The heat — and lack of rain — has forced many ranchers to sell off their stock. Many will retire; and few young ranchers are ready to step in. 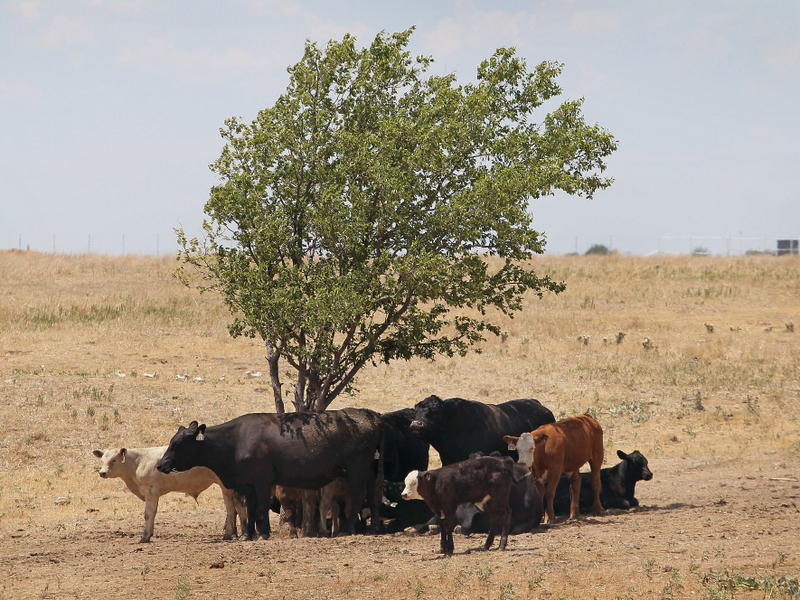 Cattle use a tree for shade near Canadian, Texas, in late July, with temperatures rising above 100 degrees. A severe drought has caused shortages of grass, hay and water in most of Texas, forcing ranchers to thin their herds or risk losing their cattle to the drought. In the cattle town of Emory in East Texas, the worst drought in state history is threatening a way of life. Scorching temperatures and a lack of rain have forced many ranchers to sell off their stock. Normally before being brought to market, cattle are penned in a rancher's best pasture to be fattened. The heavier the cow, the more the buyer pays. But the animals at a recent Emory auction look pitiful. They're standing in 107-degree heat — that's in the shade — with their ribs showing, stressed out. It's been like this for the past nine weeks — no rain. Although these cows were bred for the heat, they weren't bred for this. They look absolutely baked. If this were a normal year, an August cattle auction in Emory would see maybe 100 to 200 head. There are more than 700 head today. And that's down from the more than 1,000 head sold here every Tuesday for much of this summer. The sad truth is, East Texas is starting to run out of stock to sell. Inside the auction room, buyers in jeans and cowboy hats, here from Michigan and Wisconsin, Tennessee and Alabama, raise their fingers in front of their chests to bid. One cow, one calf, one bull after another, until late into the night. The Lone Star State is emptying itself of its cattle. Stanley Austin is a rancher and a commission-order buyer, which means he buys livestock for farmers and feed yards. 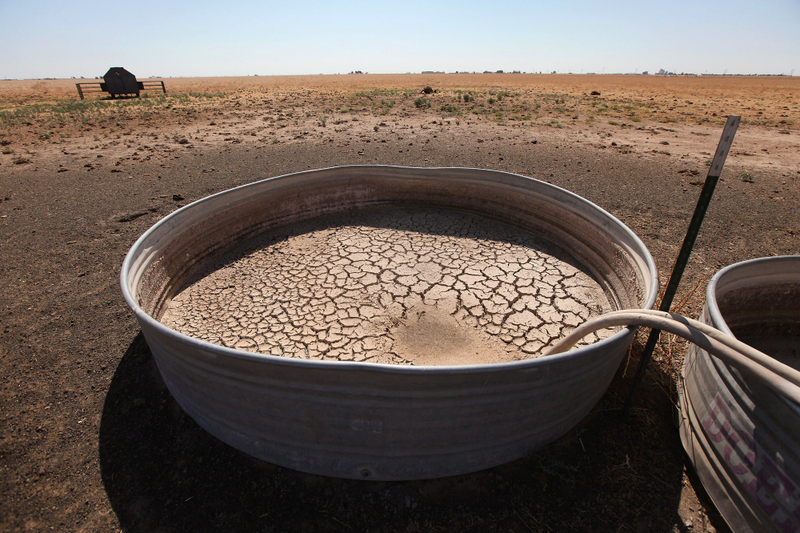 He has seen the drought's effects up close, at his family's ranch. "We've had that place in our family for 75 years," he says, "and it's never been without water. It's been without water now since about the 15th of June." Austin travels throughout Texas, going to seven livestock sales each week. He says the drought is going to alter the state's rural economies forever. Cracked mud sits in the bottom of a water tank in a cow pasture near Tulia, Texas. In recent months, the state has experienced its driest weather since records were first kept, in 1895. "It will change. It will change Texas," Austin says. "A lot of these smaller livestock auctions may have to close their doors due to the lack of cattle." Farming and ranching in Texas has become mostly an older man's occupation. One look around the auction room confirms that. And the generation gap is going to be a drought-effect multiplier. "My neighbor, he's an older gentlemen, he's been working on his cow herd for probably 50 years, he has 250 mama cows," Austin says. "He's out of water. He sold all of his cows last week. And he told me, 'I'm 70-something years old. I'll probably just retire.' "
At the livestock auction, cafe farmer C.W. Boen is telling how he almost lost his house the day before. He was off his property when he got a call on his cellphone. "My neighbor was screaming into the phone that my house was on fire," he says. "I lost my religion and drove like a maniac to get to my house, and found out that some of my neighbors and friends had stopped and fought the fire and saved my house." Some 3.4 million acres have burned in 19,000 fires in Texas over the past five months. There is charred land everywhere. It's so dry that the blistering sun, magnified through the end of a broken Coke or beer bottle, can start a fire. And as sad as the cattle look, the horses for sale can look even more pathetic. The vast majority are not working horses, they're pets — and there's no place to slaughter a horse anymore. Last week, a mare and her foal were simply given away at this auction. Watch them parade through, one by one, and it becomes clear that something terrible and perhaps permanent is happening here. "I believe there will always be cattle industry in the state of Texas," says Texas Farm Bureau spokesman Gene Hall, "but restocking those ranches when this ends is going to be a very expensive proposition." Listening to the Texas Farm Bureau's reassurance that the cattle industry is not going to go away completely is a revelatory moment. In the midst of a nasty, tenacious recession, Mother Nature is kicking rural Texas right in the teeth.